The elite journal Cell issued editorial notices in regard to 3 papers by the Swiss-based French plant scientist Olivier Voinnet (found guilty of research misconduct in many papers) and one by the Spain-based Italian cell biologist Maria Pia Cosma (some information about her papers here). The journal Molecular Cell (which editorial offices are not entirely independent from Cell) issued same note for a different Cosma paper. Despite obvious data manipulations, the journal decided not to do even as little as a correction. This is in full agreement with a previous declaration by the Cell Editor-in-Chief Emilie Marcus, who announced one year ago to be tolerating data manipulations in her journal, provided the science described is “wow” and “cool” (see details in my satire article here). Indeed, as a branch of the private business Elsevier, Cell is free to publish whatever they wish, even explicit fraud, lies and fakery. It is however the duty of all scientists, funding agencies and the subscription-paying university libraries to decide if what Cell publishes is actually any good science under such policies. Even if it reads“wow”. I will simply list the four editorial notices below, accompanied with some corresponding images off PubPeer. Naturally, none of that author-provided evidence (i.e., where it existed in the first place) which Cell found so convincing, is shared with us nosy readers. Make your own judgement, the notices speak for themselves. We the editors of Cell were contacted by the corresponding author, Dr. David Baulcombe, and the first author, Dr. Olivier Voinnet. They informed us that, in Figure 6C, lanes 6 and 7 were intended to show two different negative controls, but one of the lanes was erroneously duplicated. The authors were not able to locate the original data and could not determine how the error arose. 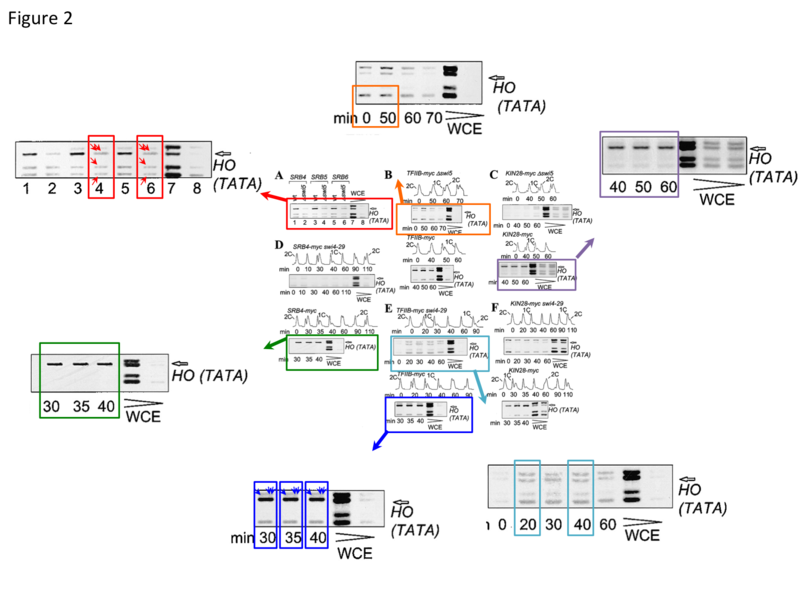 Without access to the original data, a correction of this figure panel is not possible. Our evaluation of the other figures of the paper did not reveal any additional irregularities. Given the age of the paper and that the duplicated lane does not compromise the conclusions of the paper, based on the information available to us at this time, we will take no further action. 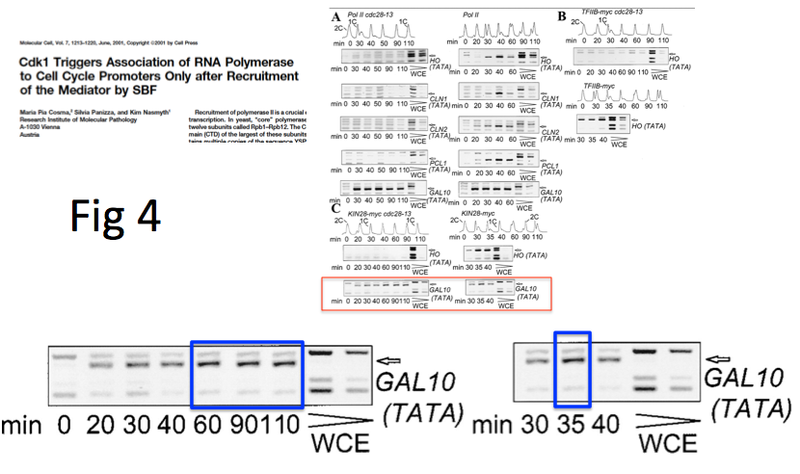 We, the editors of Cell, were contacted by the corresponding author, David Baulcombe, who informed us that this paper contains an unacknowledged image duplication. 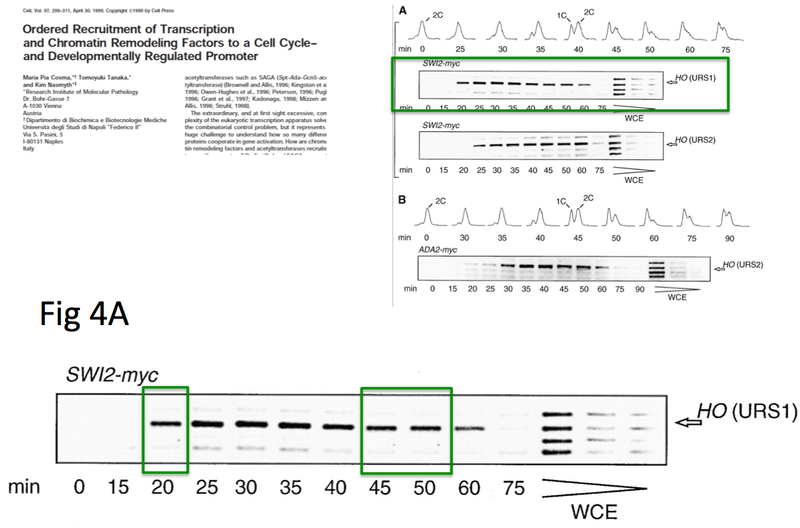 The mock control (Mock:M) lane shown in the northern blot experiment in Figure 3D is the same as the mock control lane in Figure 5D. Dr. Baulcombe informed us that these two experiments were carried out at the same time, run on a single gel, and exposed on the same autoradiograph and that they shared a negative (mock) control run in a single lane. Therefore, Figures 3D and 5D present the relevant lanes of each experiment plus the shared mock control. Dr. Baulcombe provided us with a copy of the original autoradiograph for these experiments. 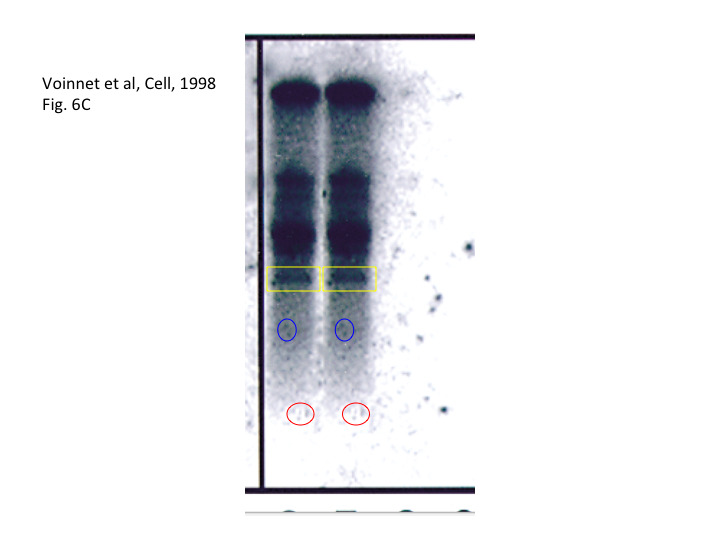 We have evaluated the data and confirmed his explanation for this duplication. According to our current policy (although the paper was published before this stated policy was established), reuse of the negative control should have been mentioned in the figure legend. However, as this issue does not call into question the integrity of data collection and/or presentation overall, and given the age of the paper, we have decided against publishing a Correction of the figure legend. Based on the information available to us at this time, we will take no further action. 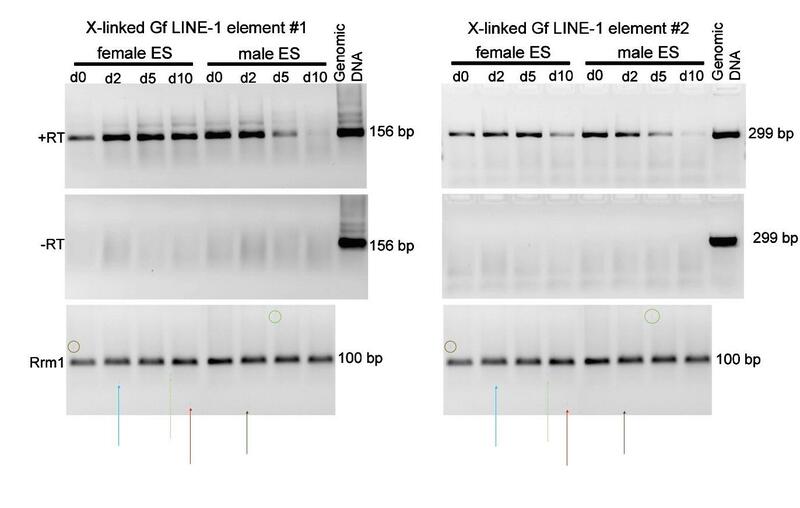 We, the editors of Cell, were contacted by the corresponding author, Dr. Edith Heard, who informed us that this paper contains unacknowledged lane splices in Figures 2C and 4C. In the preparation of these figures, lanes that were not relevant to the experiment presented were removed; however, these splice marks were not indicated in the figure or explained in the legend. Dr. Heard provided us with scans of the original data, which were prepared in her lab. We have confirmed that, in each case, the splice removes irrelevant lanes from a single gel. Although splicing should have been indicated in the figure and explained in the legend according to our current policies, this issue does not call into question the integrity of data collection and overall presentation; we have therefore decided against publishing a Correction. Based on the information available to us at this time, we will take no further action. 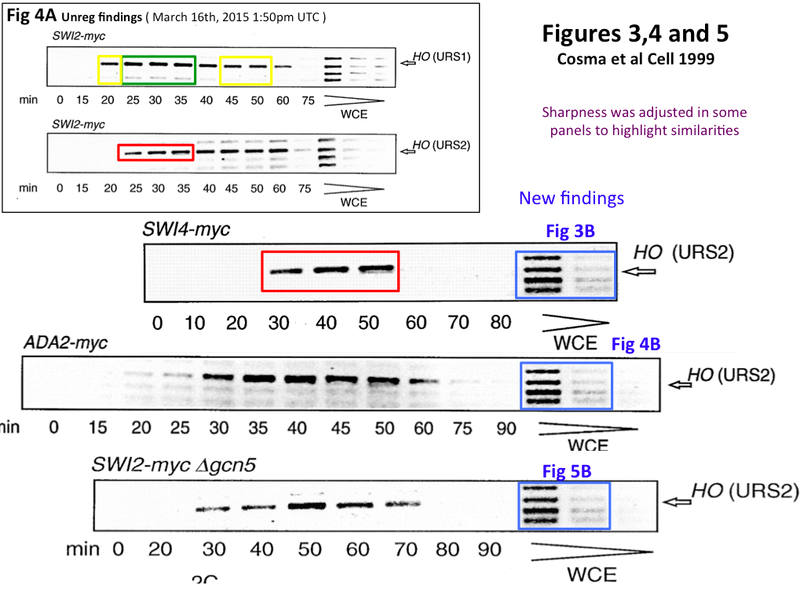 Concerns about duplicated images in Cosma et al. (Cell, 1999) and Cosma et al. (2001, Mol. Cell 7, 1213–1220) were brought to our attention by a reader. We, the editors of Cell and Molecular Cell, have investigated the matter, communicating with the corresponding author, Dr. Kim Nasmyth; the first author, Dr. Pia Cosma; The Research Institute of Molecular Pathology (IMP), where the research in question was conducted; and the Center for Genomic Regulation, Dr. Cosma’s current institute, which conducted its own investigation. The IMP located Dr. Cosma’s notebooks and provided her with high-resolution copies. As part of our investigation, Dr. Cosma brought those copies to the Cell Press office, where we went through them with her, identifying data for the figures in the paper. The notebooks contained original images, alternate exposures, and/or replicate data for most of the figures in the papers, providing support for the reported findings. In a few instances, original data could not be located, making it difficult to assess the concerns raised about those specific data panels. While we understand the reasons that the figures in the paper were flagged by the community, in our judgment the burden of proof for determining inappropriate data handling or image duplication has not been met. Furthermore, the available original data support the findings of the papers. With these things in mind, based on the information available to us at this time, we have decided not to take any further action. This statement is to notify the community of our investigation and findings. They should share the data if they want to be taken seriously. It’s not like they have a lot of credibility at this point. With so many scandals with NPG and Cell I believe this may happen very soon, also lets hope the that the publication of the reproducibility project results will speed this process. I agree that most of the images are suggestive for inappropriate lane duplication. 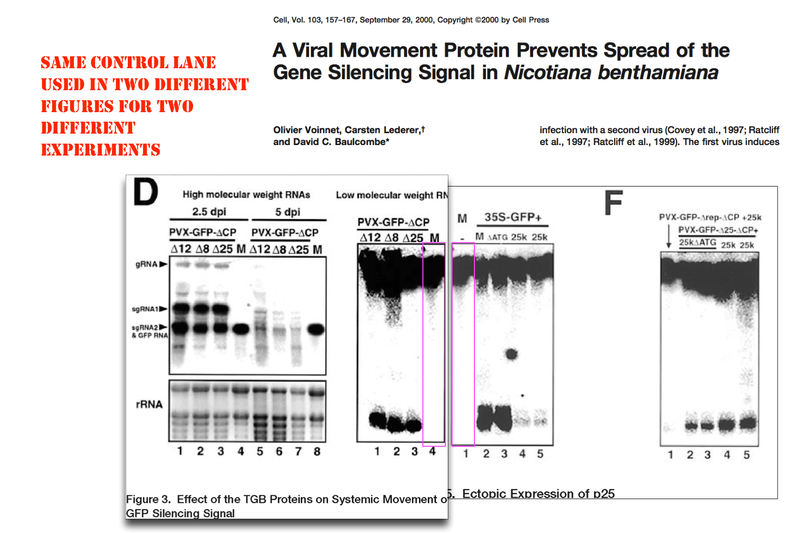 The Voinnet “Viral Movement” duplication could be explained by running two different experiments on the same gel, but most other highlighted images suggest severe problems with these papers. It is unfortunate that the Cell Editorial Board did not agree with what many of us see here. Do they give air miles for each well travelled datum? Until clear counter-evidence is seen, all the cases described above look like a clear fraud and should be denounced as such. Let’s face it: making a fake western blot or a histogram that looks real and convincing is easy, it’s scary to even think about how much fakery in top journals remains undetected! That is not surprising at all!!! What to do? Boycott Cell Press.